We present a new musical gesture controller that supports conventional and extended two-bow cello gestures with the unusual feature that it has no strings. The presentation will show how ambitious performance goals and experimentation drove a search for new gesture sensing techniques and materials that are integrated in the instrument. In 2005 I was invited to CNMAT under the UC Berkeley Regents Lectureship Program to do research on ergonomic sensor placement on my Jensen electric cello. With David Wessel, Adrian Freed, and Michael Zbyszynski, we came up with some interesting and innovative ideas about how to steer the computer from the instrument in a way that could be integrated into normal playing. We later presented this work in a paper at NIME and ICMC. This instrument was a very important improvement for me as a performer who finds the presence of a computer with all its external gadgets used to control programs on stage highly distracting. Adrian and I have since discussed integrating these ideas further into a new instrument and last summer sketched the basic design for this new instrument/controller. Since I already have some beautiful acoustic cellos, a collection of ethnic cello-sized instruments from my travels in Bhutan, Mongolia and Uzbekistan, and the Jensen instrument, I thought it redundant to make another electronic stringed instrument of any sort. Liberated from that constraint, Adrian and I extended the principle of a bowed rotating spindle sensor (already tested in 2005) to an array of virtual strings, using their endless spinning to measure speed and direction. I realized during our brainstorming session that we could more than double the "strings" intersected by my two bow technique (one bow above the bridge and one under) by constructing a mirror bridge directly underneath the upper one. This creates an oval shape that allows me to intersect 3 different sets of 4 string groupings, plus all the non-adjacent combinations of 3 and 2 string groupings. The wide flat fingerboard is covered in 6 long linear position and pressure sensor strips on the front and 6 on the back, giving me 12 virtual strings to stop, tap and squeeze. The lower bout is equipped with an infrared sensor to measure bout width as an alternative to a foot pedal controller. I feel incredibly privileged to develop this project with the support of CNMAT and Greg Moore at Maybeck House, as well as having the opportunity to work closely with the multi-talented Adrian Freed who dons the various hats of inventor, luthier, electronics designer, programmer, and musician. The facilities and support of TechShop were essential in facilitating the rapid prototyping of the mechanical components, principally laser-cut acrylic. 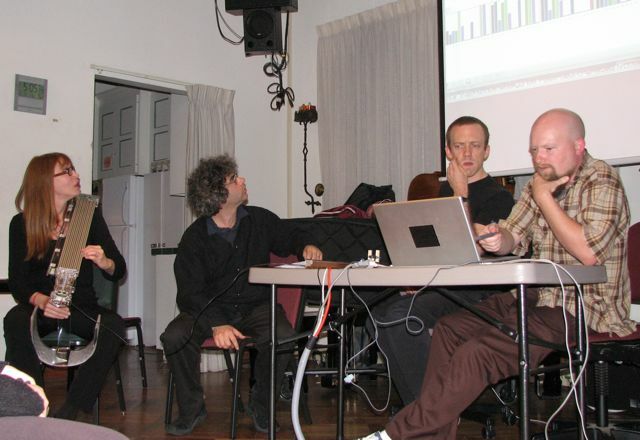 Composer John MacCallum and researcher Andy Schmeder have been essential to the project in their development of the microcontroller and Max/MSP software.